Evolution Studios has shared the information about the add-ons of the upcoming racing simulator, which the company is going to start launching once the project is out. 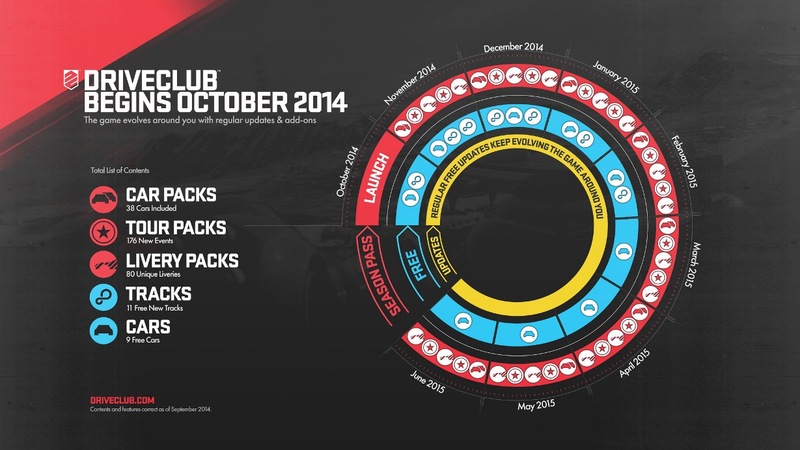 The studio’s community manager - Jamie Brayshaw - has revealed the details of the Driveclub DLCs in the PlayStation blog. Thus, according to the official information, Evolution Studios is planning to release both the premium expansions, which can be purchased, and the free Driveclub DLCs. As for the last ones, then each month, beginning from this October and till June 2015, the gamers will get one additional car. All the new racing tracks will be totally free also. For those players who’d like to enjoy all the features of the new project, the developers have prepared more exclusive content, including the new challenges and the trophies. However, they will have to pay for it. Evolution Studios will launch the first premium Driveclub DLC in November. Such add-ons will be sold both as a part of Season Pass, which is priced at $24.99, and separately. The cost of each paid Driveclub DLC hasn’t been announced, but its total price will be $75.84. Thus, by purchasing this Season Pass, the players are able to save up to 60%. Moreover, in addition to the all the mentioned above add-ons, the gamers will have an opportunity to get access to the new sports cars earlier than others, but for the real money. The release of the racing simulator will take place on October 7th in North America and on October 8th in Europe. You can watch the new video, dedicated to this project, here.